You won’t find any humor in this entry. Seriously. Stay tuned and I’ll try to be amusing in the next entry. I was moved to write the following, so thanks for indulging me. Since I was traveling for my work to Denver, specifically Aurora, I decided to visit the site of that horrible unexplainable event that happened on July 20th, 2012: the movie theater shooting. I wasn’t going there to because I wanted to satisfy some morbid curiosity. I was going because I had a feeling I knew what I would find there. And I wasn’t disappointed to find an immense memorial setup by the family and friends of the victims, employees of the businesses surrounding the area, and complete strangers from all over the country. When I arrived on the site I found the movie theater completely blocked off with police yellow tape. The entire area remains closed off and there were at least four police cars patrolling the grounds in order to keep the scene free of those who might attempt to get inside the theater. Across the street is where the memorial stands and continues to grow. As I was reading the signs and notes, I took a count of the people that were mulling about just like me. Even two and half weeks later there were at least thirty-five people there during the brief time I was visiting and they were all doing exactly what I was doing. I was reading the handwritten notes, looking at the thousands of candles, looking at the faces of the victims in pictures and news articles, and saying prayers for those who were left behind to grieve as they try to pick up their lives and carry on. There is no good rational reason that can be used to explain what happened in the mind of the shooter. Was he crazy? Was he insane? It kind of doesn’t matter—no explanation can undo what was done. But what I saw when visiting the memorial was this: One man caused a horrible event—and then thousands of people constructed a memorial in tribute to those who perished. The memorial clearly shows a strong and shared belief in Jesus Christ. There were permanent markers hanging from the large banners. These markers were used to scribe the words written by a countless number of people. Their words scribbled out phrases like “God Bless”, “Jesus Loves Everyone”, “Our prayers go out to…”, “You are remembered in my prayers”, and on and on. I wrote on one of the banners “God Bless everyone” and signed it “Cincinnati”. I saw similar writings from cities in Iowa, Florida, California—a showing of faith spanning coast to coast. So I am certainly not claiming that there is any way to justify what happened on that night not so long ago, because there isn’t. Nor can I even begin to understand why. But what I did observed is how one lost misguided soul became the means for thousands of people to publicly and openly profess their love for their faith in Jesus Christ. God is good. God bless everyone. This entry was posted in Humor, Uncategorized and tagged jesus, theater shooting. Bookmark the permalink. I appreciate your thoughts on the memorial. Very encouraging take on it. 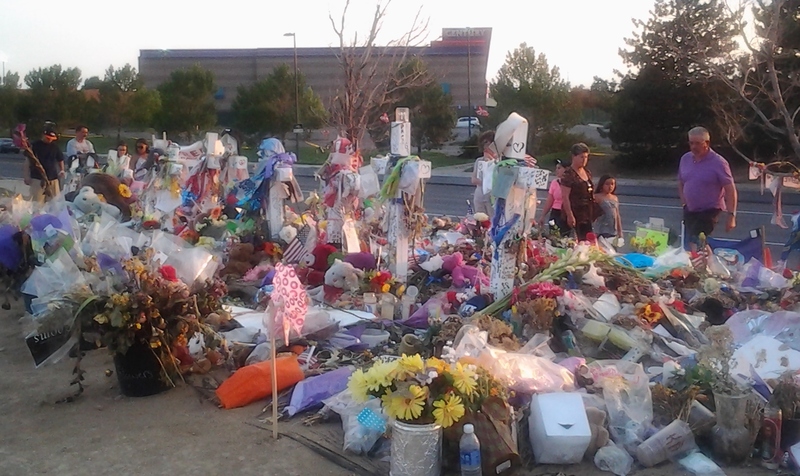 Prayers go out to those who lost their loved ones in the theater shooting. Thank you for sharing your thoughts on the memorial Marcus. My eyes actually got watery while reading. These kinds of crimes are so sad/senseless… But it is amazing to see how it brings people together, and brings out their faith. If I saw the memorial in person, I’d be all tears. Thanks for sharing.